Involvement with public entertainment is a serious criminal offense. But that won't stop AKB0048 from performing for their fans. -- Yuko spreads some love. Four young girls attend an illegal "guerrilla" concert. 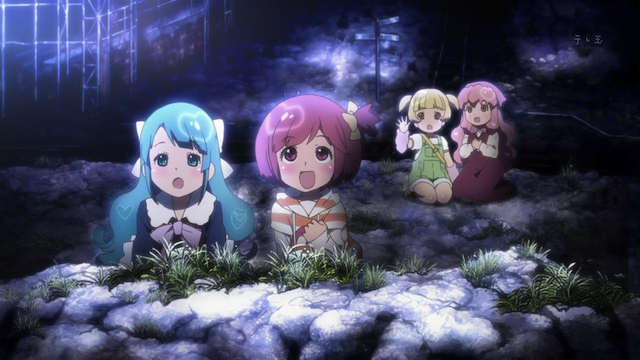 -- from left to right: Chieri, Nagisa, Yuka, and Orine. 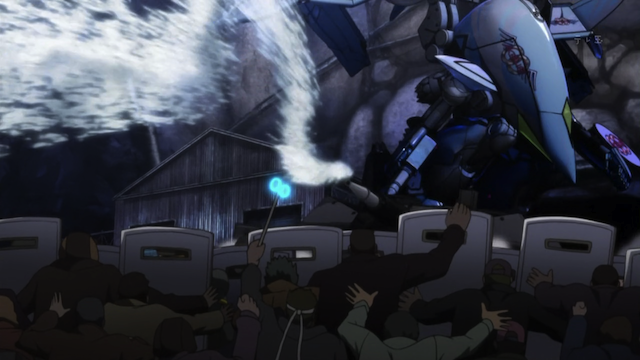 A police raid leads to mecha battles, truncheoning, electrocution, and all sorts of mayhem. Standing up to the man with a glow stick. Honestly there is no way to convey how fabulous the fabulousness of the first half was. It had all kinds of action, and was completely insane. That is a good time right there. And that’s BEFORE the spaceship took off! A spaceship that looks like a goose. 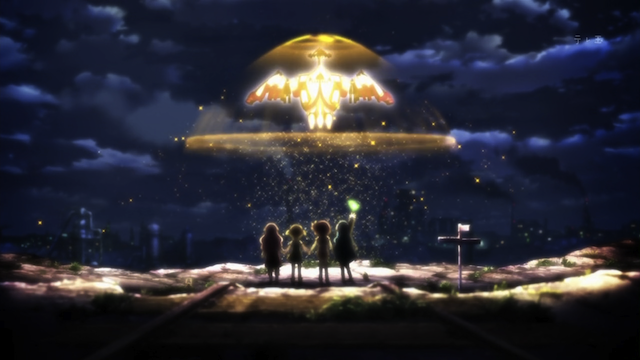 AKB0048 take off in their spaceship, leaving behind some wonderful memories. The action in the first half made watching this episode worth it, but what about the second half? It actually had some very good artwork as well. The planet that the protagonists live on is some sort of mining / factory world, and many scenes showed off a kind of grimy palette, and backgrounds loaded with smokestacks. Several characters (including two of the girls) use some sort of powered unicycle that looked pretty cool. Interior scenes in Nagisa’s house were loaded with interesting details. Satelight has done a very nice job of producing a first episode that looks great. 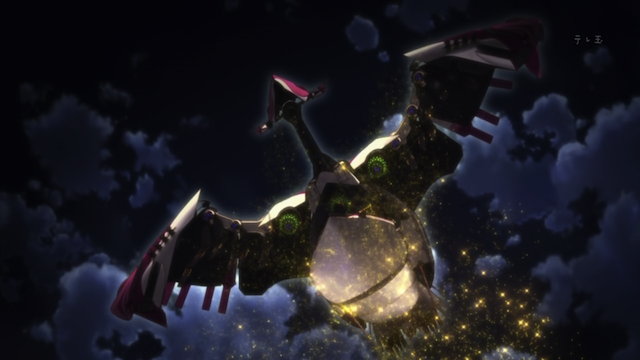 AKB0048 seems to be run by an electronic brain that is worshipped as a god. The girls apply for internships and they get selected, so they’re off. That plus a lot of dorama is the second half of the show, except to point out that there was a very noticeable absence of one of the four girls from the first half. Chieri’s absence was never mentioned, so she must have left the planet at some point. 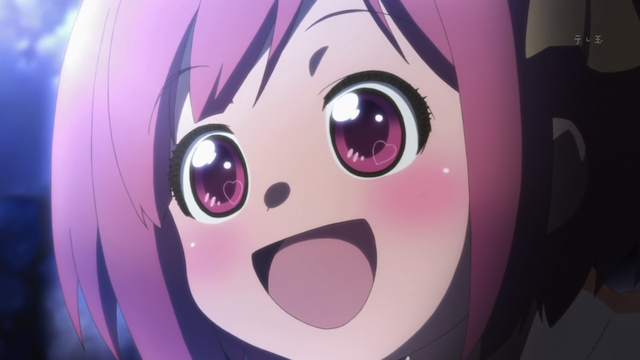 I’m guessing she will appear at AKB0048-HQ. The episode ended VERY melodramatically, and frankly the closing scene, in which one character runs and somehow catches up to a spaceship taking off is impossible for many reasons. For one thing, passengers can’t open the doors of a moving train, so why should we believe a moving spaceship would allow passengers to open the door during take-off? 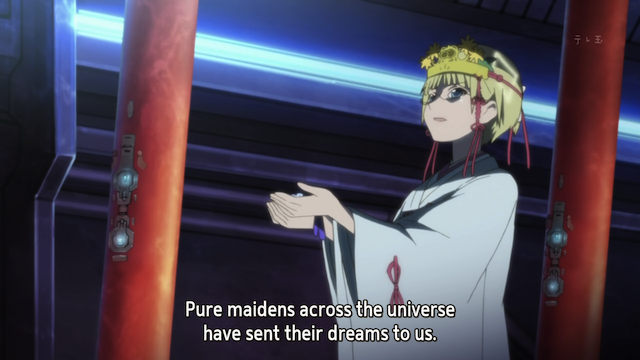 Well, this isn’t the sort of show that will make perfect sense. It is essentially emotion and spectacle, and the first half delivered completely irrational spectacle, so I say this first episode was a fabulous success. Wondering why the government has banned entertainment? Just look at what it does to your eyes. -- Honestly I have never seen this before. The girls even had heart-shaped hair reflections. I guess we're pushing the moe envelope. To me, I just don’t know what to make out of this. I wouldn’t have mind if they focus on singing and dancing, but inserting other crap like fighting just ruins it… but it sure makes a great drinking game show. I like the rebellion against anti-entertainment forces part of it. 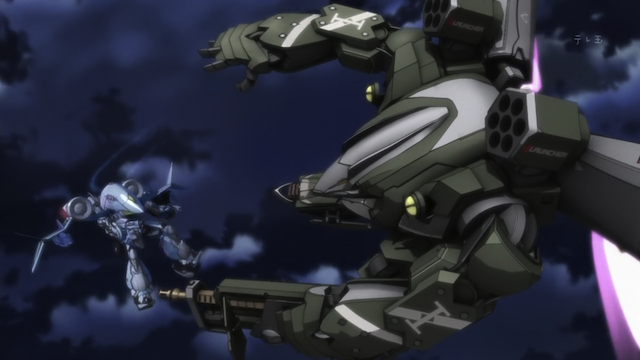 Now it might end up that they never find a way to balance the mecha angle and the performances, but I think it will be interesting to see what they acheive. asfsagdhasfdgah this episode was gorgeous T_T. Amina and Nakayan’s voice acting as Yuuka and Orine was flawless. Mecha’s and my favorite idol group, this is like some dream come true. Haha but oh my god those heart shaped eyes were funny to me too. I wasn’t sure what would happen based upon the promo art, but it actually looks VERY good. I took a bunch of screen caps that I didn’t end up using, just because I was impressed by something like the use of color, or the background details. I had totally written off this show but after reading your review, I’m not sure I can ignore the overwhelming fabulousness. fabulosity? whatever it is, I’m going to give it a shot; at the very least the animation does look amazing. 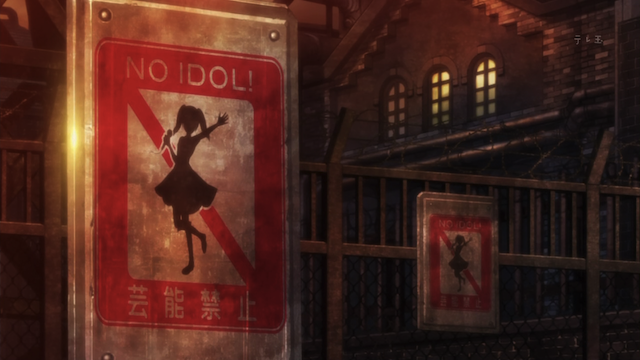 is it necessary to have a background in idol anime though? because I have none. No. 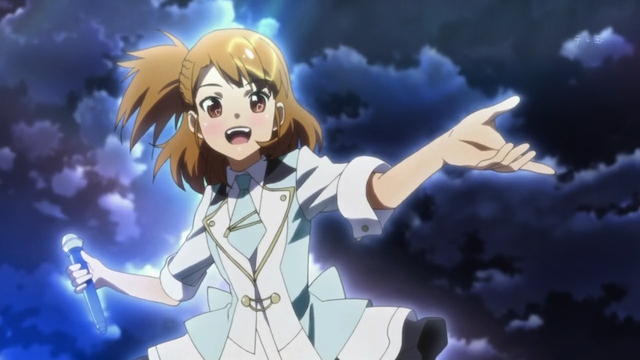 I don’t have a background in idol anime, and it is very easy to understand. It’s basically goofy with some dorama thrown in for good measure. I really like the way the animation came out. I wasn’t expecting it to look quite this good. Oh my gosh, this show looks crazy. I expected it to be an offensively bad advertisement for AKB48, but it looks like there’s some actual effort put into it. I need to check it out for all the action and melodrama you speak of. Definitely check it out. I would be interested to hear your comments. It probably still resolves to an advertisement for AKB48 in some way, but maybe not the way you anticipated.